We use a bucket composting toilet (the Humanure Handbook, by Joseph Jenkins is a must read! ), so we don’t have sewage or black water. 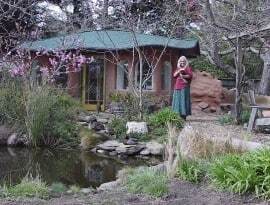 This post covers greywater only (non-sewage waste water from sinks, shower, laundry, etc). If you combine your sewage with your greywater, you need to dispose of that black water properly. The following solutions are NOT applicable to black water (sewage) treatment. Disclaimer: This post does not cover location-specific codes that may determine what can and can’t be done with graywater. Always check with local authorities before attempting any of these solutions. There are many ways to either filter/re-use or dispose of greywater from your tiny house. Here’s a run-down of what we think are some of the better options. For ALL of these solutions (other than septic), it’s very important to only use all natural, biodegradable soaps and cleaning products (like Dr. Bronner’s), so the water that returns to the landscape will not harm plants, soil, or other creatures is may come in contact with. Also please note that greywater should not be stored for more then 24 hours (gross things will start to grow in it — so use it on the landscape right away and do not store long-term). If you are able to drain your greywater into a traditional sewer or septic system, then great. You might as well use it and save yourself the hassle of a separate system. Just make sure your septic system is able to handle the increased input, if already heavily used by another dwelling on the property. 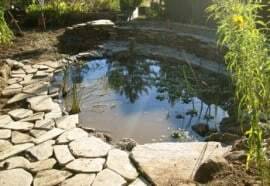 It’s possible to use a reed bed and frog/fish pond to create a multi-stage filter to remove nearly all impurities from greywater exiting your house, AND to return that water to where it’s needed within the landscape. Of course this only make sense if you have a permanent (or near permanent) parking spot, or your house is NOT on wheels. The end result can be a beautiful wetland system/pond, like those seen here. This is another great option to filter greywater, then return it to the surrounding trees or other areas in need of watering. Of course you have to have a hill sloping away from the house. This is a great option because it involves no permanent changes to the landscape. For more info on this system, see this https://tinyhouselistings.com post. 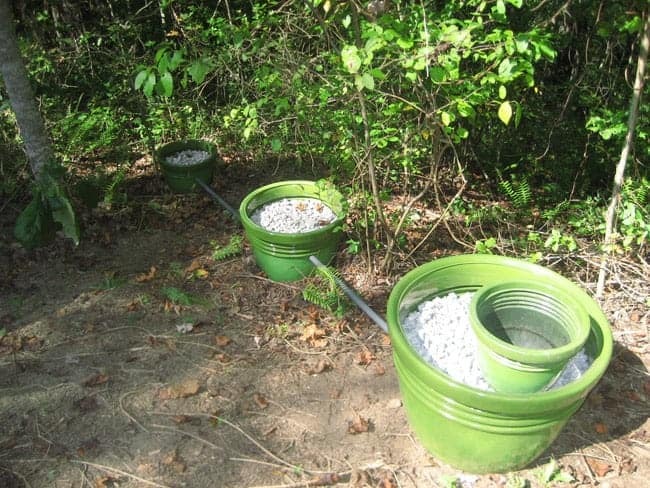 Many branched drain configurations can be used to help disperse greywater over a wider area — to deliver it to multiple areas of the property that may need the extra water (like young fruit trees). Though these methods don’t do much in the way of filtering, the idea is to disperse the water, so it all does not drain out in the same place. This is accomplished by a branched system or a perforated, seep system that allows water to drain out slowly over it’s entire length. Branched systems can take whatever shape is dictated by the landscape. Some examples are shown below. A more temporary version of a branched drain (and one that requires no digging!) 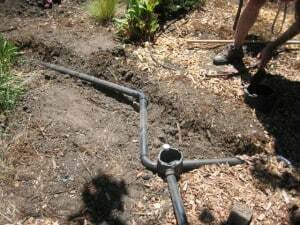 would simply be to connect your PVC drain pipe to a garden hose manifold. 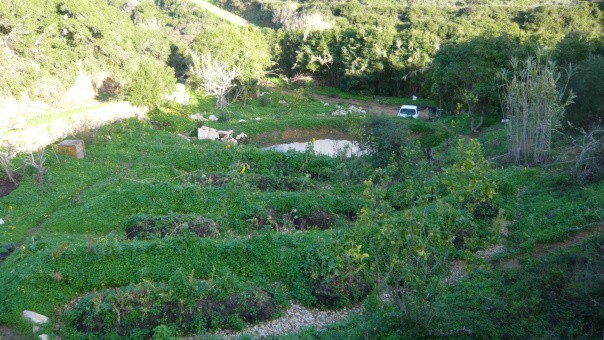 From there, 2-4 hoses could lead directly to a few drought-prone trees for constant, light watering. 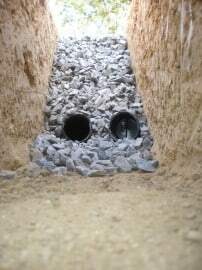 French drains are typically created by digging a single ditch, laying a perforated drain pipe down its length, then filling the ditch with gravel, sometimes of varying sizes, depending on depth. French drains do some filtering, as the water seeps through the gravel, but they do not distribute the water as widely as a milt-branched drain system would. 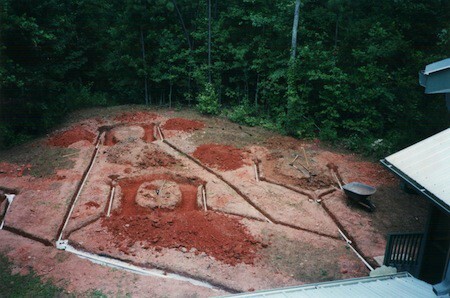 Both branched and french drains require a good deal of digging and other permanent earthwork, so may not be idea for many tiny house owners. However, to bring water to trees, shrubs, or other specific areas to use for direct watering, these options are perfect. If you live in a more urban environment, or in another situation where none of the above options will work, you may be required to collect your greywater in a tank, then take it elsewhere (a nearby storm drain, maybe?) to be dumped. If this is the case, your best bet is a wheeled tank, built specifically for this purpose. They come in all sizes, but to avoid dumping as often, larger is better if you can handle the weight to pull it when full. 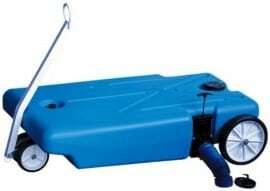 A popular option is the Barker 4-Wheeler Tote Tank, often referred to in the RV world as a “Blue Boy.” Amazon sells them in all sizes, up to 44 gallons. You can also try installing the GWRS unit that not only allows outdoor irrigation, but also provides safe potable quality water for indoor use too. I am especially pleased with the safely features of this system, specifically the prevention of harmful detergents that may seep into my garden. Save money, save water, save the environment. Plus, where else can I find a system that allows for such easy installation and maintenance?!? Do NOT dump into a storm drain!!! Storm drains usually flow directly to neighborhood streams and rivers, unprocessed. Even if you’re using biodegradable soap, it shouldn’t be put directly into waterways (without the breakdown that happens when filtered through land or other on-site system).